The brand new Alvinnn! And The Chipmunks TV series is coming to DVD this summer and I have one copy to give away to one of you lucky readers. Summer of Sport is the first volume of season 1 and will be released on DVD on 13 June. It will contain 14 episodes from the 52 episodes of season 1 and three more volumes will be released over the coming months. 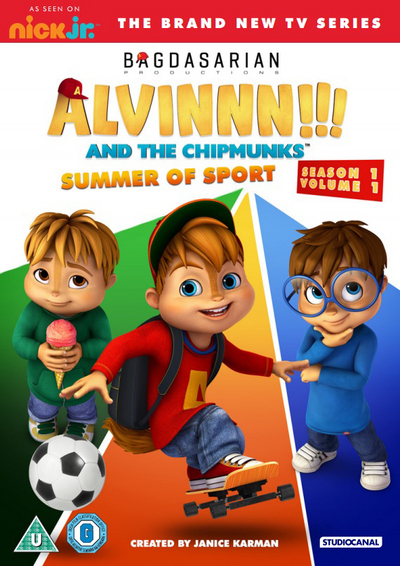 This new series features Alvin, Simon and Theodore as well as the Chipettes; Brittany, Jeanette and Eleanor. Single parent, David Seville, continues to parent all 6 chipmunks and many of the episodes see the chipmunks pushing his patience to the limit in various hilarious ways. Chunk has loved the Chipmunks since he was quite small- I think their squeaky voices and songs have always captured his attention as well as the cheeky antics that Alvin tends to get up to. I remember watching it when I was a teenager so it's one of the more fun programmes for me to watch with him so I'm glad he likes it! To be in with a chance of winning this DVD complete the form below, good luck! Otherwise the DVD can be ordered from HMV and Zavvi. Alvin, because he is fun! Theodore is my favourite character he's just so cute. Simon because he is very clever and has a cheeky side. Theodore because he is so cute. Theodore as he is lovably sweet! Simon, the voice of reason! Theodore is the funniest - I am told !!! I like Simon the clever one. Theodore, he is super cute! simon reminds me of my son. Alvin because he's so cheeky!! Theodore because he is a bit cumbersome! Alvin as hes the little terror and always in trouble but has a good heart really. Theodore as he is so cute! Simon as he's the clever one! Simon. He's just great always the thinker,steady going sensitive chap. I love Theodore because he's a quirky wee dude. Simon, we love a braniac!